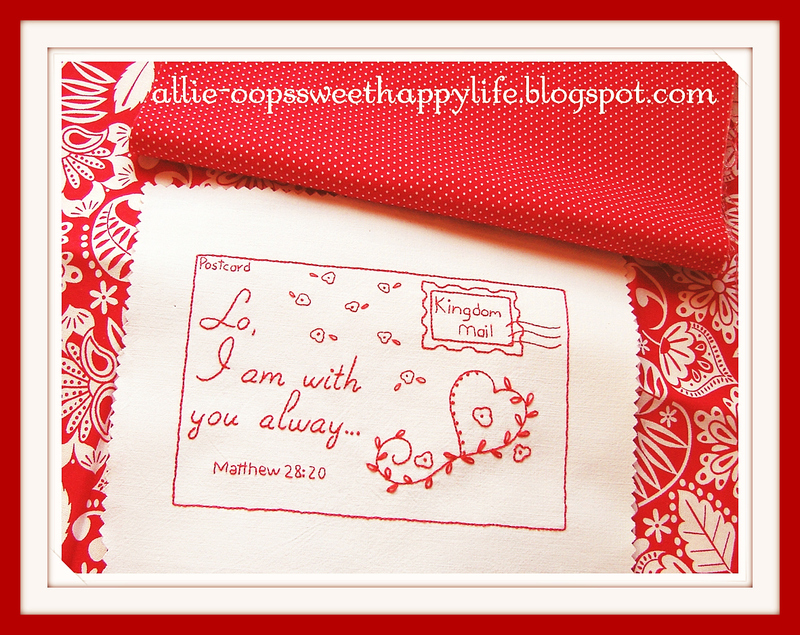 It's the 1st of February and that means it's my sweet friend Allie's turn to share a new postcard pattern with you! Beautiful, huh!? And the fabrics she's chosen are gorgeous, too. Allie is stitching her blocks in redwork and using the KJV as her text, whilst mine are being stitched to compliment the fabric I've chosen for their final display, and the wording will be more conversational some months (my own design months) or written from a modern Bible text during Allie's design months. Head over HERE to Allie's blog to download her postcard pattern and you can be stitching within the hour! 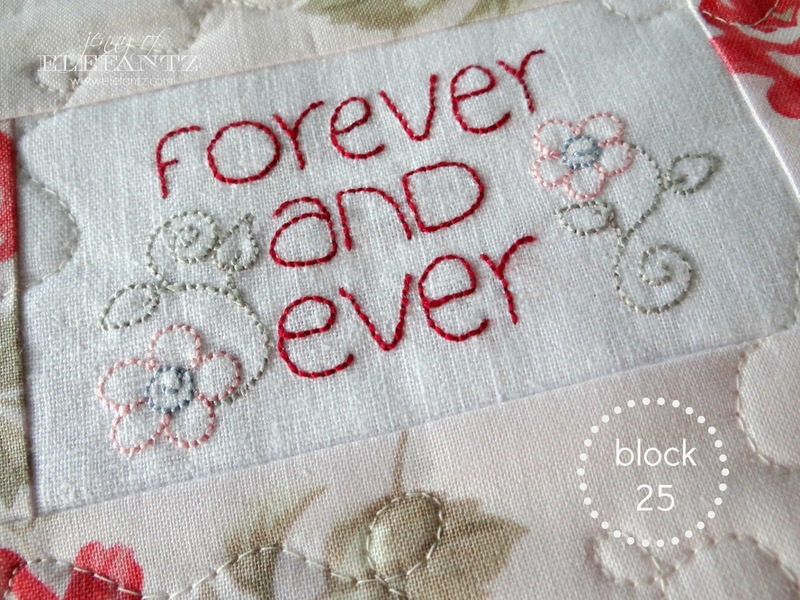 Don't fret, the first block is still available from my Craftsy shop as a free download if you've just heard about this free BOM recently (all the info is HERE). Over the course of this year Allie and I are tag teaming our blocks so in December we shall have designed and gifted you six postcards each. We pray you are mightily blessed! 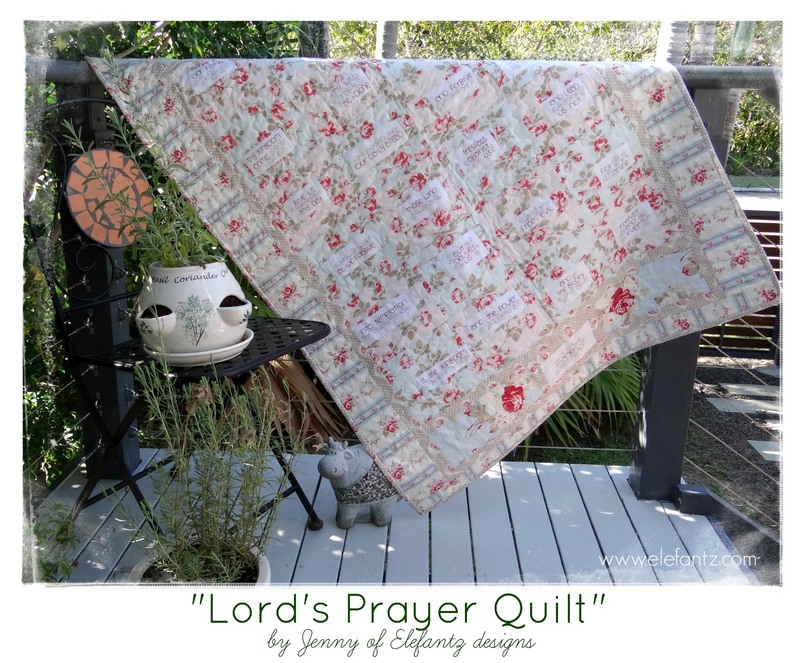 I've had a number of requests lately to re-issue the full pattern for The Lord's Prayer quilt. 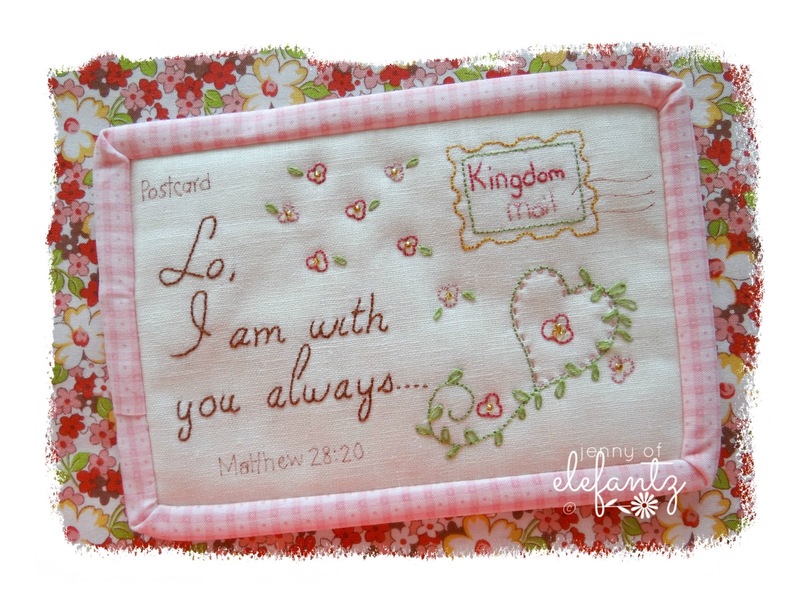 This was a free BOM I shared through 2014 and includes 26 stitcheries and a quilt pattern to embroider and piece the prayer that Jesus taught His disciples. You'll find it HERE on my shop again as a free download. 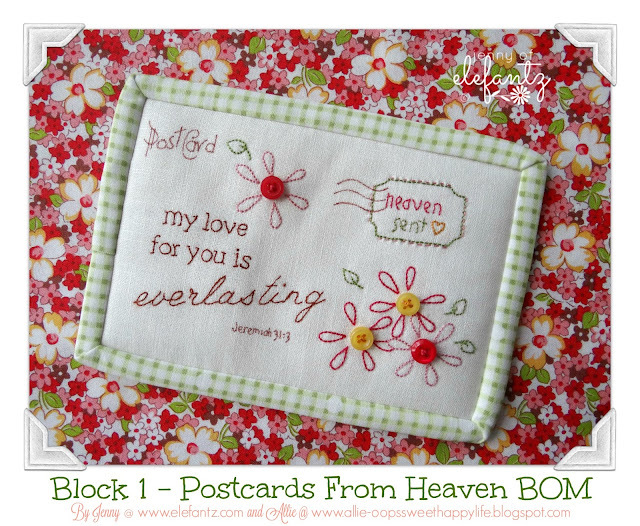 Love the postcards and you are so kind to give another free quilt pattern! Love, love, loving these postcards from heaven! I haven't stitched one yet, but it is definitely on my list of things to do. These are beautiful! Good Morning Jenny! Such a delight to see all of the beautiful stitching on your post this morning and every other post also. They always fill me with a warmth. I will be downloading definitely, but it may take some time to stitch with all of the other stitching that is going on in my life right now. It is so fabulous though to have these beautiful projects to charm my home or to give as gifts. I will surely be downloading the Lord's Prayer Quilt how spectacular! Thank You Jenny! May your day be filled with Love and Kindness. Have a fantastic creative day! Just adore your soft colours and beads, my dear, so very pretty! 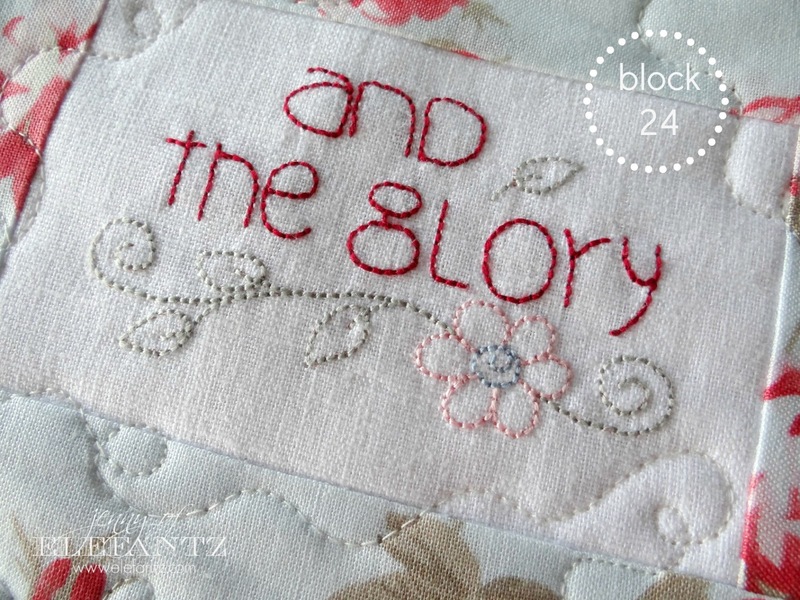 The Lord's Prayer quilt is on my list...as soon as I finish Daisy Days. Love love love them both so much! Thank you for reposting The Lord's Prayer Quilt. I've been working from the individual patterns as issued in 2014. It will be nice to have the entire pattern in one place. 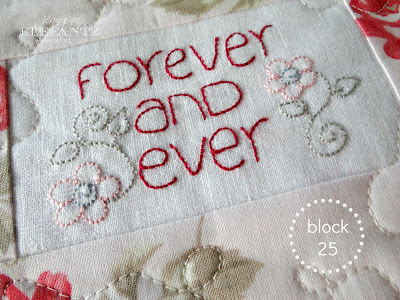 A new month of Happy Hearts and lovely stitcheries. Thank you dear for always sharing so generously. Oh I love both versions. I need to get my sewing room back in order so I can start creating again. I know I have The Lord's Prayer traced out and in a box somewhere.